Darren Aronofsky is no stranger to difficult films. From his hallucinatory feature debut Pi to his metaphysical triptych fantasy The Fountain, his cinematic worlds are often a hopeless personal struggle against overwhelming, even cosmic odds. The other theme to which he most often returns is that of all-consuming passion (be it ballet or wrestling, or—if you want to give in and get really dark—addiction), and the ways in which that pursuit both defines and demands sacrifice from those caught up in the pull of something that almost inevitably ends in Phyrric victory. In an attempt to turn these twin themes into bedfellows, Aronofsky turned to the legend of Noah, who received orders from God to build an ark that would preserve animals from an oncoming flood designed to punish humanity for its sins by wiping them off the planet. While remaining true to the bones of the story (including the eyebrow-raising postscript involving Noah drunk and naked), Aronofsky hoped to humanize Noah and his family, even against the scope of a tale expanded to a nearly three-hour epic, with a fantasy world fleshed out both onscreen and in a companion graphic novel. Below, Aronofsky talks to Lightspeed about the challenges of adapting such a ubiquitous story, responsibility as superpower, and how you should probably stop hoping for giraffes. Though the story of Noah is a particularly popular religious tale, it’s also a particularly short one (particularly if you skip over the section with a drunken Noah post-flood), whose beats are relatively cut-and-dry. What initially inspired you about the story—and what challenges did you run into when using the story as a blueprint for the larger work of the graphic novel? 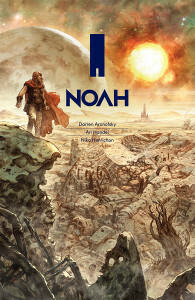 The graphic novel version of NOAH is available now from Image Comics. Actually, we didn’t skip over the drunken Noah. That moment is one of many things in the Genesis story that are not so cut and dried once you start to look at them. Noah getting drunk once he hits land raises really interesting questions about what Noah might have been thinking and feeling throughout his ordeal—an inner life which Genesis is silent on. There’s a lot that Genesis is silent about and actually a lot of interesting questions that the story raises once you read between the lines. Why was Noah’s family spared and others killed? Was it because they were good and everyone else was bad? Then why does he curse his son’s line to eternal slavery? And if the flood eradicated wickedness from the world, why is the next story in the Bible The Tower of Babel? And if it didn’t eradicate wickedness, then what justifies so much destruction? Exploring these kinds of questions was both challenging but very inspiring, too. There’s a strong theme in Noah of the relationship between responsibility and compassion, with various factions trying to obey what they feel is a moral imperative; your Noah in particular makes some hard decisions—one or two of them are darker than similar decisions made by Noah’s enemies. How did you work toward thematic balance? To us, this is exactly one of the questions we were trying to explore. At the beginning of the Noah story, God judges mankind for their wickedness and says He will wipe them out for their wickedness. By the end, God is merciful—and says He will never again try to do that, no matter how ingrained man’s wickedness may be. That balance, responsibility and compassion, or justice and mercy, is something that resonated with us as parents—with your kids you can’t be too strict or you’re cruel, but you can’t be too lenient or you are doing them a disservice. And it’s something both St. Augustine and the Rabbis have explored, too. Some have even said that to be truly righteous means finding that balance—and that’s how we thought about Noah’s righteousness and Noah’s struggle. You’ve mentioned that you had the ark designed as per the original measurements found in the religious story (which is a very specific takeaway! ), but many of the animals presented in the movie are decidedly fantastic. What was the initial impetus for that decision, and how did the design of the world develop? When people think about Noah and the Ark, there are strong associations. That house boat and the giraffes and the old man in robe and sandals and knee-length beard. Those associations are so ingrained that they distance us from the power of the story. We wanted to smash them and make people look at Noah with fresh eyes. Two of every animal on earth. If you stick with zebras and elephants—that’s a trip to the zoo. But there are millions of species on this planet. And most of them are strange and bizarre looking. And that’s just the ones that are alive now. If the Noah story is about saving that cornucopia of life, we wanted people to feel the richness and diversity of that life, to show them the unfamiliar—to underline how strange and wonderful and varied Creation is. 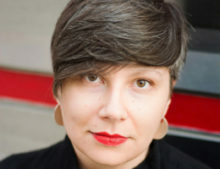 How did you find molding the same story to fit the two different mediums? Fortunately, that wasn’t really a problem for us. We wrote the script as a movie. And at one point when we didn’t know how or when the film would get made, we gave an early version of the script to Niko Henrichon. He did most of the hard lifting of adapting it into a graphic novel, and while he was doing that we were working to visualize it as a film. In your other films, you’ve often set up thematic arcs where the situation surrounding your protagonist is essentially hopeless—a darkness inherent to the story. At the same time, you’ve also directed films (as with The Fountain) in which a personal struggle is acted out on a mythic scale. What aspects of your previous work have helped inform the conceptualization of Noah? With Noah, the story really came from the Genesis story. It’s epic, the fate of the world and all life is at stake, and yet it’s also so small, one nuclear family, alone on a ship for a year, adrift on an endless sea. I attacked the story from both those sides—make the size and scope and majesty of the pre-flood world and the flood itself feel as big and otherworldly as possible, and still drive down into the emotions and struggle of the family that is trying to survive it. Finding that balance is what focused the conception of the film.